The question is: What did we bury inside this HOLY OBJECT? And Why it is miracle? Please read this. Kyabje Lama Zopa Rinpoche gave this teaching at Atisha Centre, Bendigo, Australia, on March 17, 2000. 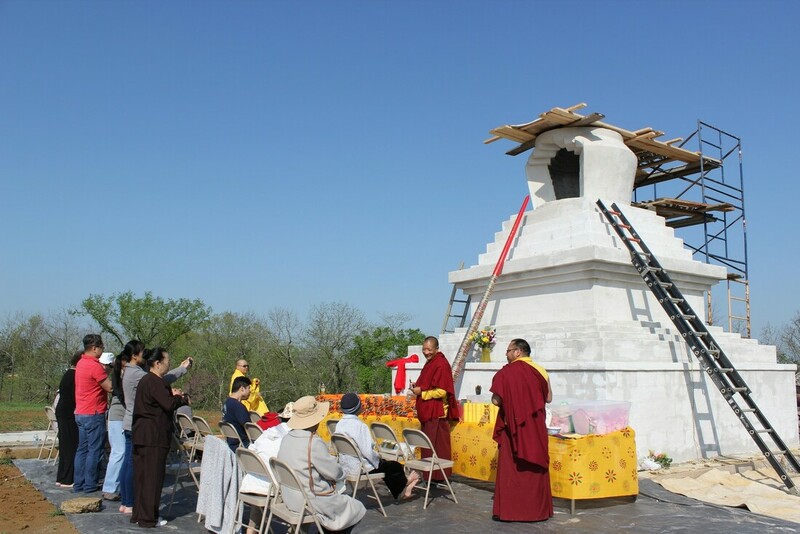 Included is a discussion with the architect and artists for the Great Stupa of Universal Compassion, and a brief address to the CPMT 2000 delegates at Chenrezig Institute on April 3, 2000. Circumambulating stupas, statues of enlightened beings and scriptures, as well as doing prostration and making offering to all these things, naturally becomes virtue, becomes Dharma, the cause of happiness. 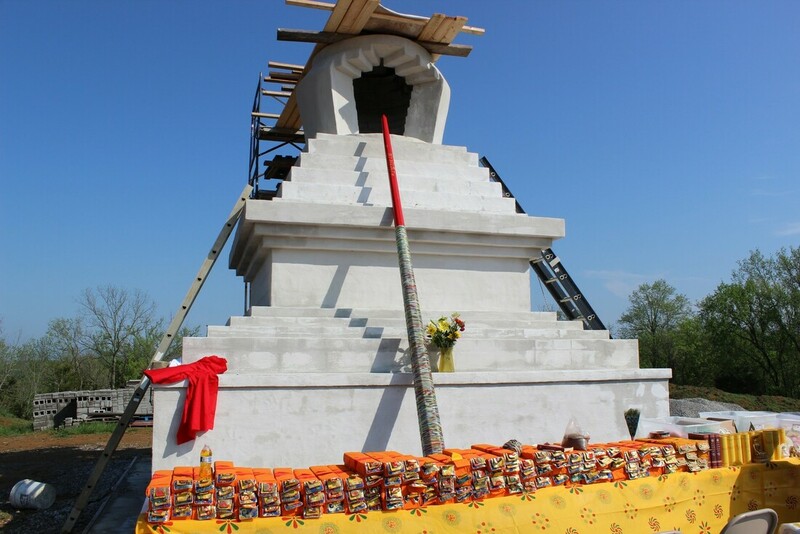 This is due to the power of the holy object, the fully enlightened beings or statues, scriptures or stupas. 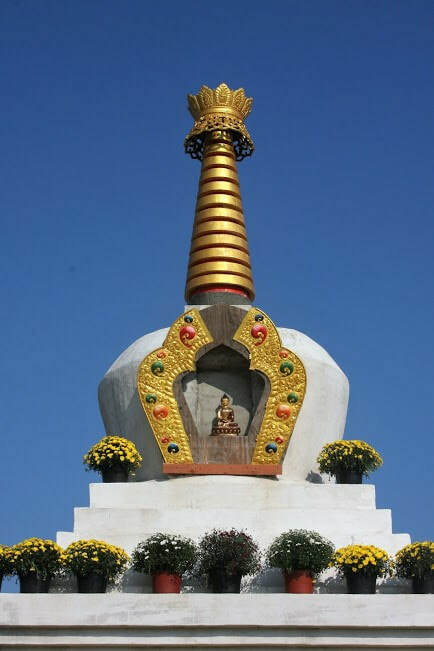 The stupa which has arisen is the fully enlightened beings’ holy mind, the dharmakaya. Here the important point to understand is the practical benefits of these holy objects existing and the benefits of making these holy objects for us suffering beings whose mind is obscured. The cause of the sufferings arises like a storm, like a heavy storm, like a rain-shower and our mind is overwhelmed by these disturbing emotional negative thoughts. Therefore, by having holy objects such as this stupa, by having and by making these things, it makes it unbelievably easy to purify our mind and to purify all the minds of other numberless living beings. It is so, so powerful! So powerful to purify, without hardship, just by going around, by seeing the holy object, even just by seeing and by touching, by circumambulating, by prostrating, by making offering, it purifies inconceivable defilements of negative karma, the cause of the suffering. 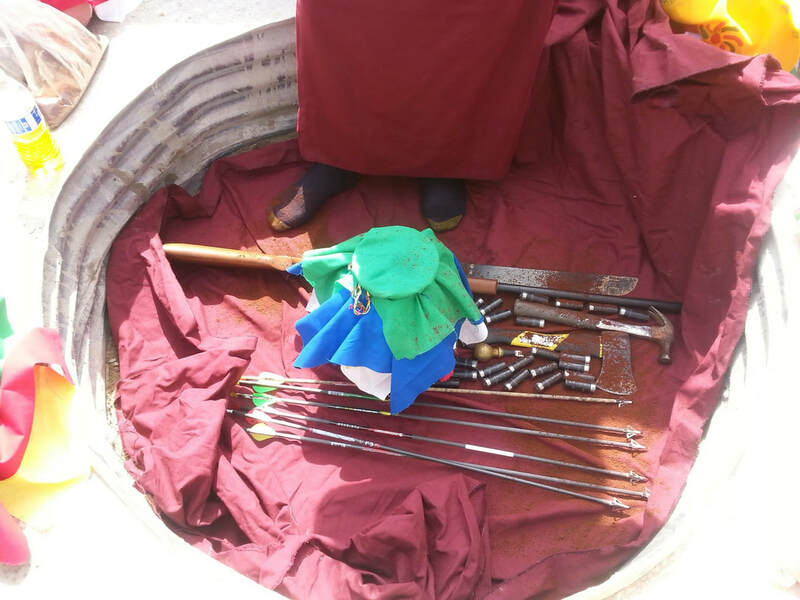 There’s a special mantra in the stupa that goes on the Life Tree, the root that goes in the centre. There are four very powerful mantras that have been written with real gold. So there are four mantras called Dharmakaya Relics and one of them says Secret Relic. That mantra has unbelievable skies of benefit for the sentient beings who circumambulate, make offering and prostration. By having this mantra in the stupa, human beings, animals, anybody who circumambulates around it one time has the power to purify the negative karma to be born in the hells. The hell realm has eight hot hells and eight cold hells—these are the immeasurable ones—then there are six or four neighborhood hell realms, then the ordinary hell realms. I’m not going to expand any more on this, which is my favorite subject. Anyway, by going around one time, the negative karma to be born in the eight hot hells is completely purified—just by going around one time! By having this mantra, the secret relic, inside the stupa, it’s just so easy to liberate ourselves and other living beings. 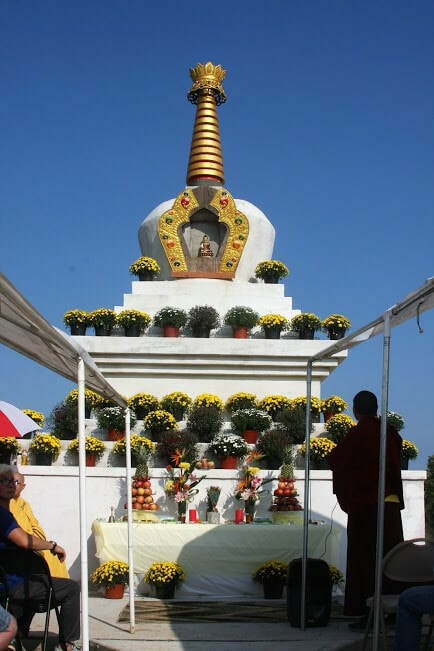 When the wind blows over or touches a stupa, the wind becomes blessed and has the power to purify. 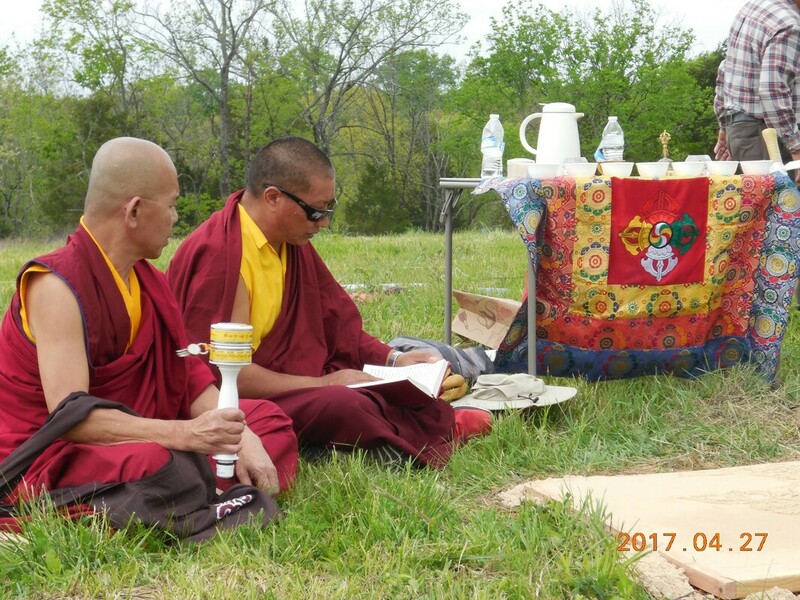 When the wind goes away from the stupa, whomever the wind touches—animals, flies or insects or human beings, their negative karmas get purified. They are not reborn in the lower realms—the animal, hell and hungry ghost realms, and they receive a good rebirth in the next life. It is the same when there’s rainfall. 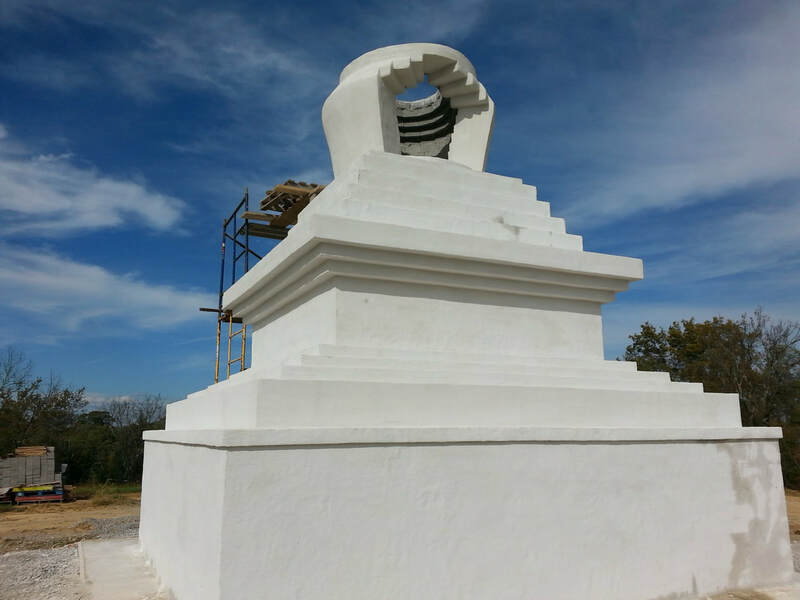 The rainwater that touches stupa again becomes blessed. So when there’s rain and the water runs from the stupa and goes on the ground, any insects, worms, or any living being living in the ground—whomever it touches, all their negative karma gets purified. They receive a higher rebirth and become liberated. So then, even the small bells that don’t make much sound—when anybody hears the sound of a bell which has been offered to a stupa, whether it is on top of the stupa or around the stupa, their negative karma—even the very heavy negative karmas of killing one’s father, mother, an arhat, even harming a Buddha or causing disunity among the Sangha (the five uninterrupted negative karmas), are purified. Whoever has done these heavy, negative karmas immediately goes to be reborn in the hell realm without any interruption after this life. There are eight hot hells and the very last, the heaviest one, is where they get reborn and experience suffering for eons. So these negative karmas are very heavy. By having the Secret Relic mantra inside the stupa—this is one of the mantras that goes on the Life Tree that goes inside the stupa—even the bell offered to the stupa becomes powerful. Then anybody who has these five uninterrupted negative karmas—and hears the sound of the bell, gets purified. It is so unbelievably powerful. 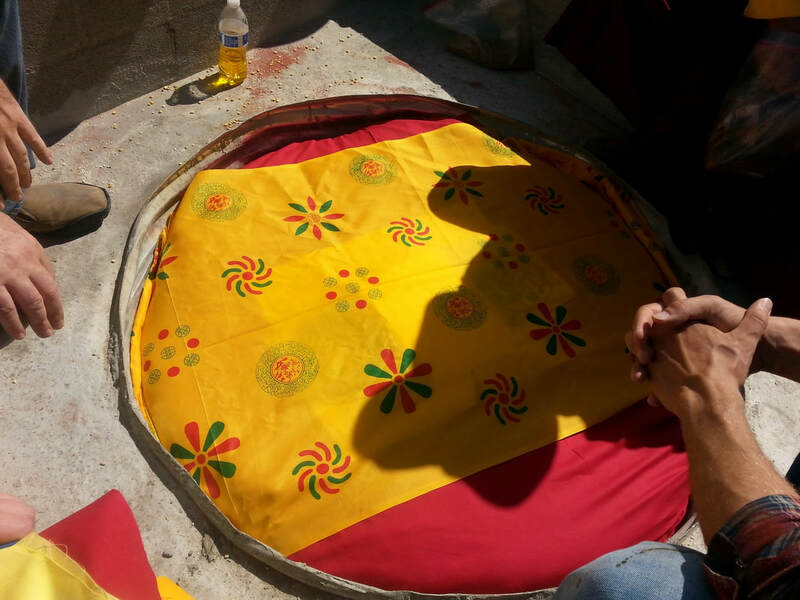 Even dreaming of a stupa or remembering a stupa that we have seen, plants the seed to enlightenment. It plants the seed to total liberation and everlasting happiness—to be free forever from all the suffering causes and to attain the highest enlightenment. We plant the seed of liberation and enlightenment even when we dream of a stupa. So then, anybody who sees the stupa, even animals, just by seeing the stupa it becomes an incredible purification of the mind. A sutra by Buddha called the King of Concentration (Samadhira­jasutra) talks about the power of the holy object. It says that even if someone draws the line of the Buddha—the enlightened being, the holy body of the One Who Has Gone to Bliss, meaning one who has become enlightened —on a stone wall, just even the line drawing of the holy body, and even if somebody looks at it out of anger, that line drawing of the Buddha’s holy body will cause that person to gradually see ten million buddhas. But here, “ten million” is just a number, just a name. It means numberless buddhas. Just by seeing the drawing of the enlightened being’s holy body on a stone wall, even if the attitude is angry, not pure, even so, we get so much benefit by looking at it. It purifies the mind; it has that effect of purifying the mind, and it causes us to see numberless buddhas in the near future. We will hear Dharma and receive the realizations of the path to enlightenment, then we will achieve total liberation, free forever from all the suffering and its causes, and we will attain the highest enlightenment by completing the Mahayana path. So, here the quotation from the sutra says that by seeing even the line—even by drawing the Buddha’s holy body on a stone wall, the benefit that we get on our mental continuum is like the limitless sky, purifying the mind of all the defilements. Then we will receive all the realizations. 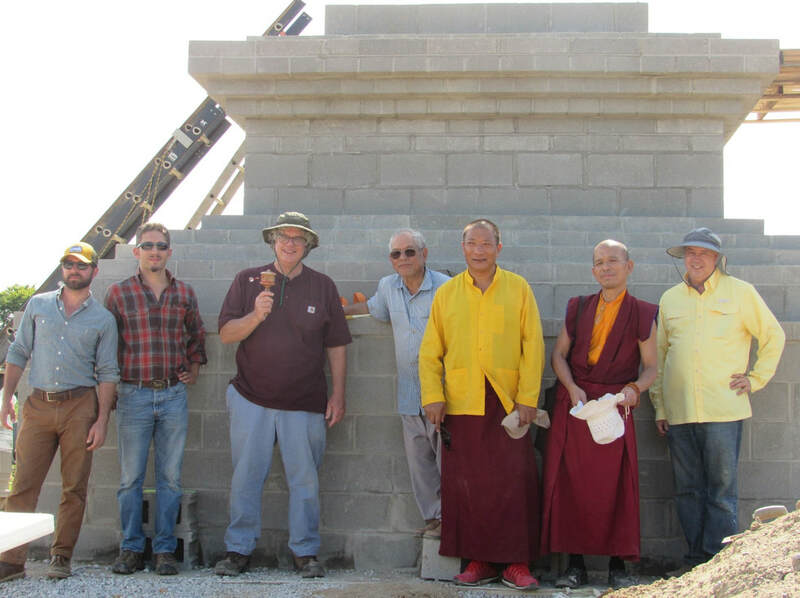 Therefore we are extremely fortunate, unbelievably fortunate that we are able to build this stupa for these beings, and (referring to the Great Stupa of Universal Compassion being built near Bendigo, Australia) this is the start. This is just the beginning. 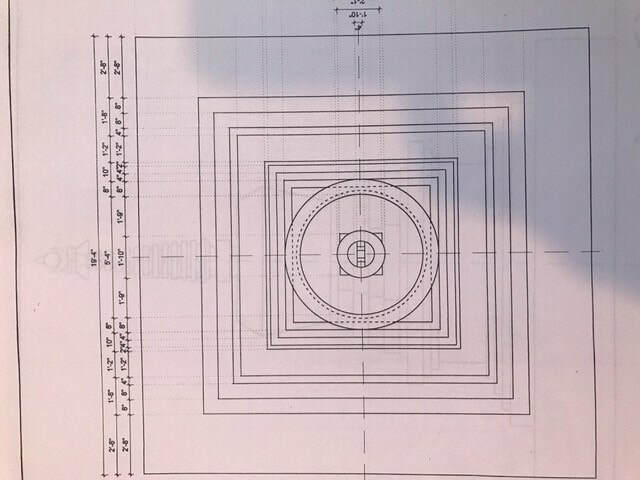 Still we have the large stupa that has to appear one day. Still we have the large stupa to appear one day. And one hundred thousand small stupas, or is it one hundred million? Yes, one hundred thousand prayer wheels around and also many small stupas besides the big one. Some of the key benefits of what other sentient beings receive are in that infinite explanation in the text on the benefit of making prayer wheels and stupas that Buddha himself explained. If you read this, it’s just mind-blowing. It’s just unbelievable. Because I saw this text, that’s why others have many stupas— at Kopan, in Solu Khumbu and Iceland. This is the same even for animals, human beings, or anybody who circumambulates or prostrates. As I mentioned before, even if the motivation is not pure and is only negative, the action of circumambulation, prostration and making offering immediately becomes the cause to achieve enlightenment for that person, for that animal. Then, by the way, it will even be the cause to achieve cessation of the whole entire suffering and its causes. By the way, achieving good rebirth for hundreds, thousand of lifetimes in the human body or deva, and having wealth and happiness and whatever we wish for in the future lives, all comes from that one good karma—circumambulating or prostrating or even putting two palms together to the stupa. 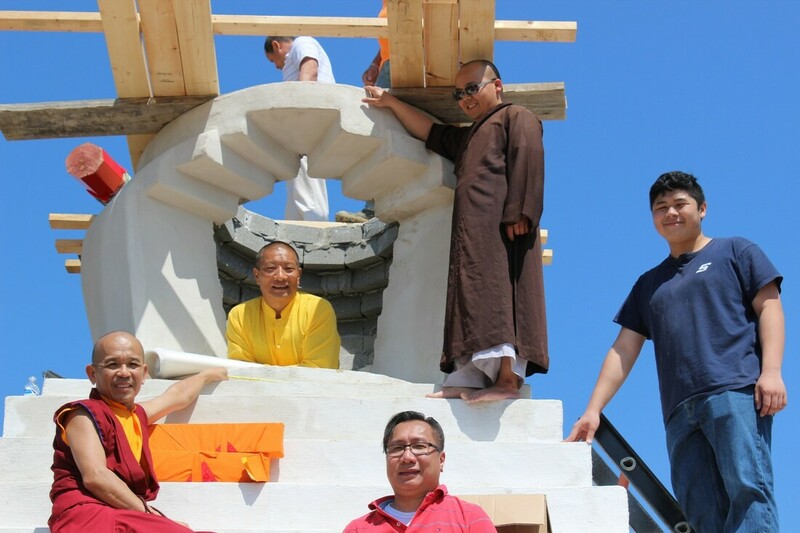 That is not laying down the body—even just putting our palms together to the stupa immediately becomes the cause to achieve enlightenment. It becomes the cause of success, happiness, and the like, so when we offer the grain, we visualize a wish-granting jewel, like the story of the King Ashoka. So we visualize gold, diamonds, and the most precious thing among the possessions, which is the wish-granting jewel. By praying to that, all our wishes get fulfilled. Anybody who prays to that jewel, all our wishes, whatever enjoyment and comfort we want, we immediately receive due to the power of the material, the jewel and due to our good karma, together. So like that. The most important benefit is that these holy objects help to purify the mind and collect extensive merit so that it is possible for people to have realizations of the path easily. That is the main function of these holy objects— to help us sentient beings have quick realizations of the path to enlightenment, by the power of the holy object. You can dedicate the benefit or merit of helping the holy object to family members who have passed away. You can dedicate the merit to all the people who are dying of cancer now, to all the people who have AIDS. If you want to do something to help family members who have passed away, for their good rebirth, then dedicate your merit in supporting and giving contributions to this holy object. And you can dedicate to all sentient beings who are suffering now, and that all those who support the project have a good rebirth too. As well, you can dedicate for world peace. There are so many ways you can dedicate the merit every time you make a contribution to the project. And you can pray for the quick realizations of all sentient beings. I am extremely happy and it feels very positive. When I walked on the land it was very positive and it feels like it will be very successful. 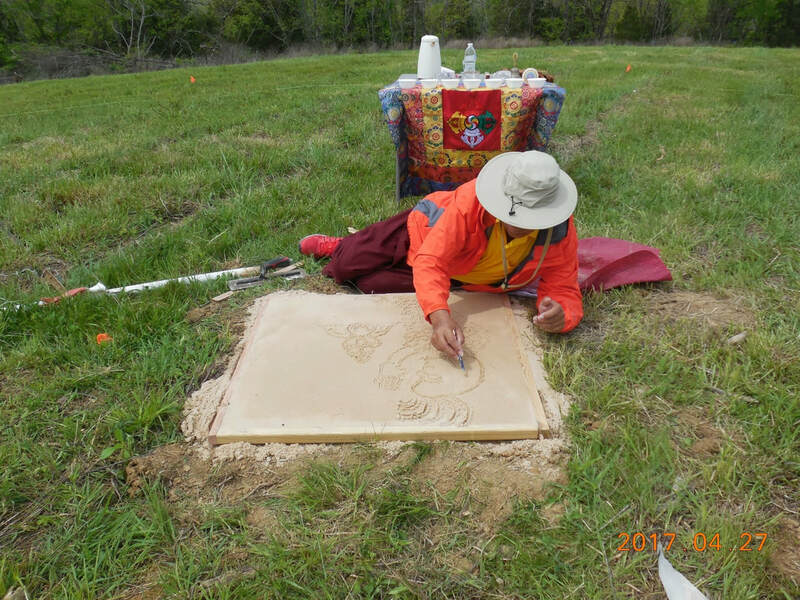 I understand, for all the many hundreds and thousands of years that the stupa will last, every day it will liberate sentient beings in silence, without words, without us talking Dharma to them. Sentient beings who come here, just by seeing the stupa, all those people will have their minds purified. So many negative karmas get purified. Even the insects who get killed by machines during construction will not be reborn in the lower realms. Even those beings that die during building will get a good rebirth. It is mentioned by a great Indian teacher in a text called Matasara, or something like that, that even if you make food for the people building the temple your negative karma gets purified. 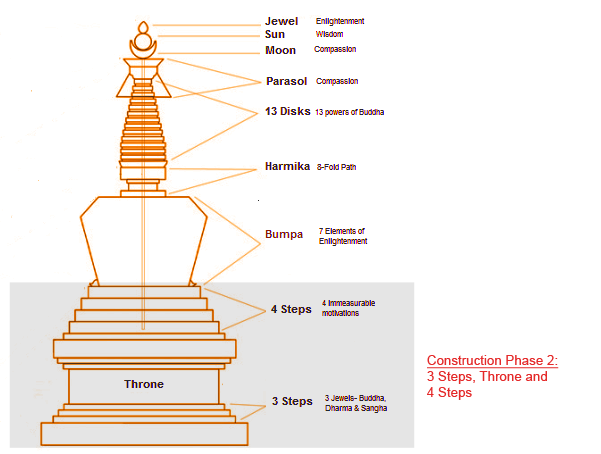 So therefore the stupa is very powerful for purification. Every day it liberates many sentient beings and we must remember that. Even though our lives are not long, the time and effort we put in here, that which we have contributed or built; wherever we are in the six realms or the pure land, or whatever, our effort is continuously benefiting other sentient beings, liberating them from samsara and bringing them to enlightenment. So, like that, even though our lives are short, our effort benefits for a long time. We are liberating numberless sentient beings and bringing them to enlightenment, and we should realize this long-term benefit of our contribution and our dedication. 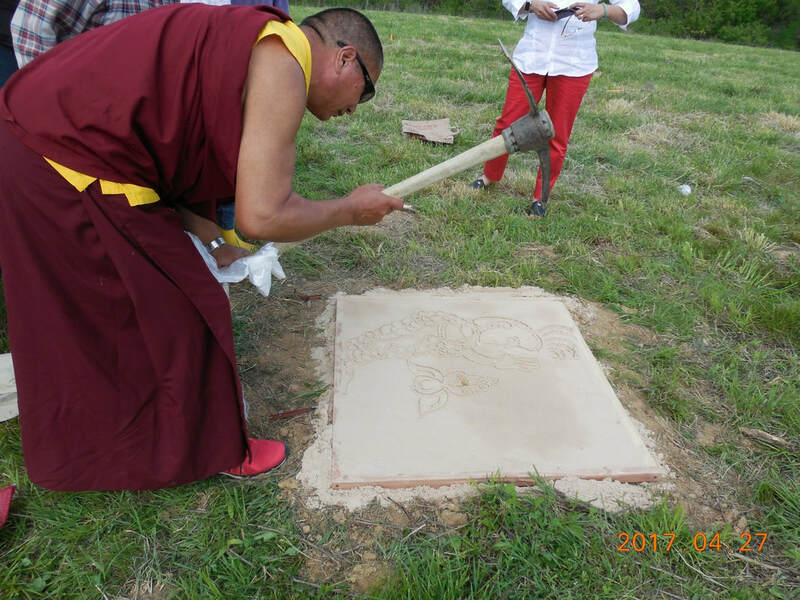 Since you have dedicated so much, you have inspired me to put my little contribution to the stupa, so I offer AU$10,000 for the stupa. At this time I dedicate this offering for the benefit of all sentient beings, so that all my virtuous friends like the Dalai Lama have a long life, and that the teachings of the Buddha and Lama Tsongkhapa flourish and spread, and that all the projects here including the monastery and the stupa succeed, due to this merit as quickly as possible, immediately. Then may it cause all sentient beings to generate bodhicitta in their mind. May it bring peace in this world and may all beings achieve enlightenment as soon as possible and may all the wars, disease, killings, poverty, death by fire, water and earthquake cease, and may all the negative karmas be purified. May all the people who are building, all the benefactors, anyone who is giving time, energy and financial support, including Ian and Judy Green, the directors of the project—may everyone have a long life, may all their wishes succeed immediately and may they achieve the path to enlightenment in this very lifetime. So, we dedicate the merit of this offering. 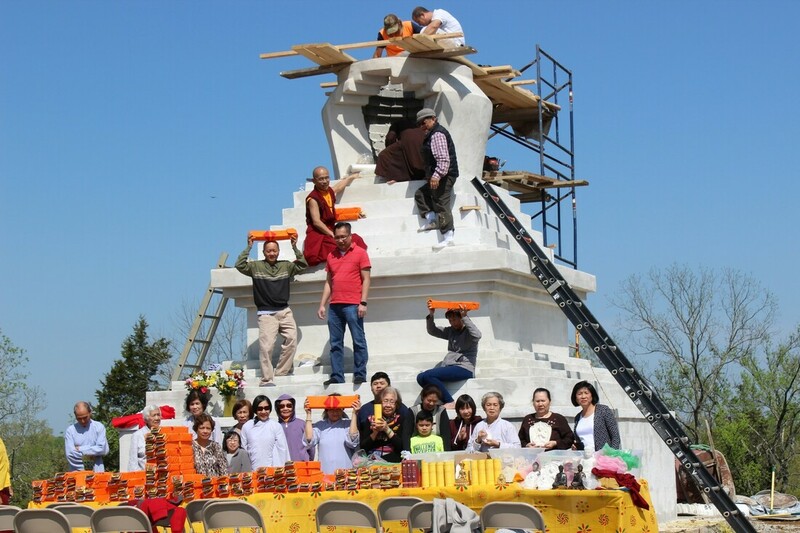 Regarding the small stupas and the ashes of benefactors, the ashes are to go in containers underneath the stupas, not in the stupas themselves. Make sure that the mantras go the correct way up, because going upside down can cause problems. 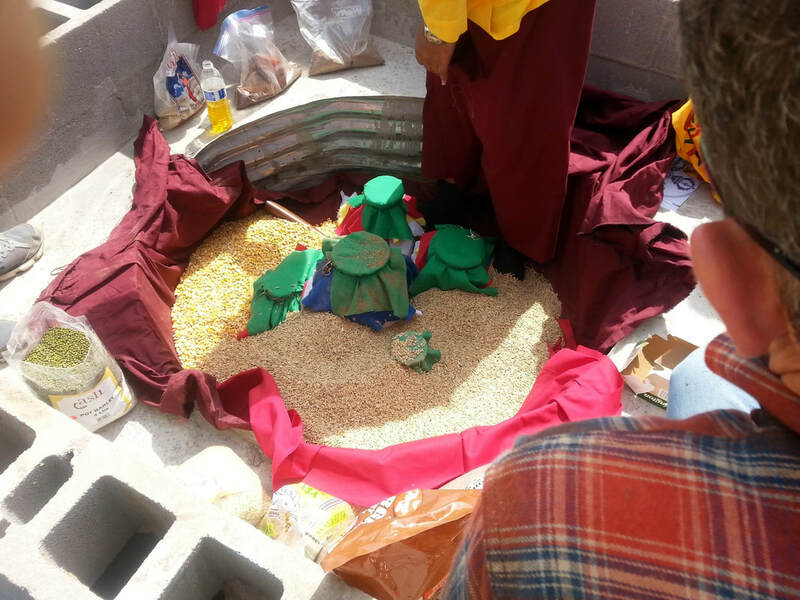 Items that were buried inside of section 1 (the bottom of the Stupa): basic foods such as rice, corn, weeds and jewelry. Items that were buried inside of section 2: tools, knives, firearms, etc. 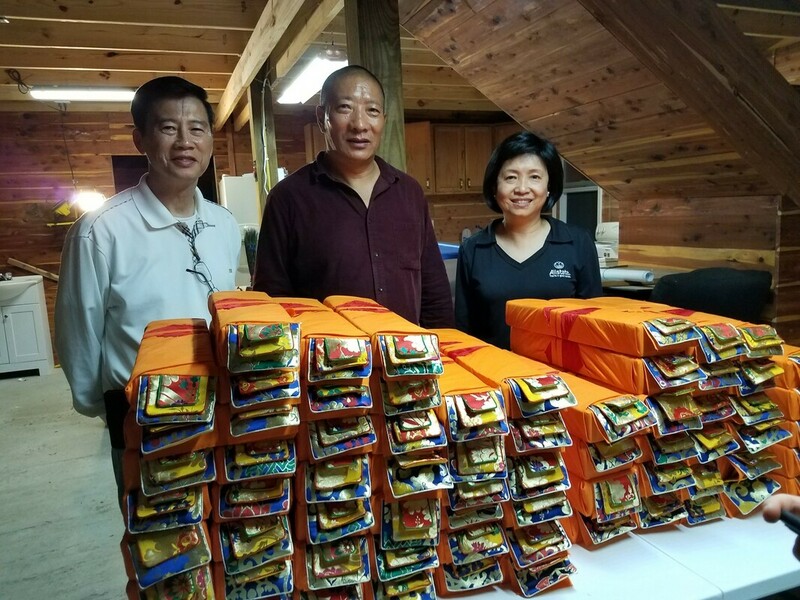 Items that were buried inside of section 3: 100 volumes of Sutras and 400 statues of Buddha.